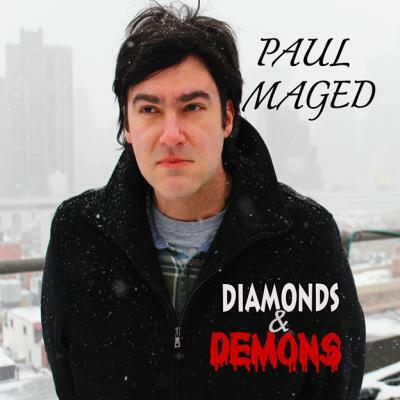 Paul Maged’s critically acclaimed sophomore album, “Diamonds & Demons”, the highly anticipated follow up to his debut record, “In My Time”, is available at all online outlets including but not limited to iTunes, Amazon and Spotify. Physical CD’s with 4 panel eco wallet are available at CDBaby. Diamonds & Demons is produced by Multi-Platinum Producer Sean Gill. Maged’s new music announces an exciting and uncompromising voice in Alternative Modern Rock. His songs have depth and explore concepts, social issues and universal themes such as climate change, human warfare, religion and today’s evolving society, that are very passionate to Maged. Maged studied music at the Boston Conservatory and then attended the American Musical & Dramatic Academy in New York. He has appeared in several independent films including festival award winner “Bobby G. Can’t Swim,” and has performed stand-up comedy throughout the Tri-state. In 2011, Maged began a labor of love, writing the songs to his follow up album, Diamonds & Demons. Musically inspired by the sounds of the current Indie scene as well as Maged’s own influences such as Pearl Jam, Green Day, Billy Joel, Elvis Costello and R.E.M., the songs exude an eclectic diversity. Lyrically they are brutally honest; an intense exploration of modern day society and Maged’s own struggles and questions within it. The vocals are delivered with urgency and edge, breathing story, life and soul into every piece. Paul Maged is an artist for a new age, having taken the common definition of a Singer-Songwriter and blown it away, creating his own unique sound infused with punk, grunge, altrock, indie pop and balladeer, in the form of an Modern Rock Artist.